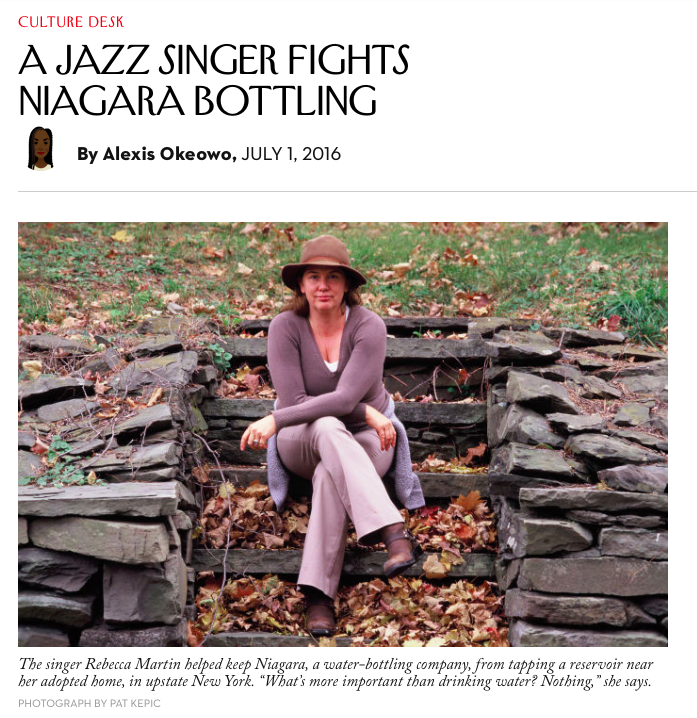 “A Jazz Singer Fights Niagara Bottling” in The New Yorker. “Our group’s initial objection was that an enormous amount of the city of Kingston’s public water supply—1.75 million gallons per day—was to be sold to a bottling company to bottle and to sell without enough evidence that our water source could maintain that amount over the long haul,” she explained. “We were also disturbed that a multimillion-dollar corporation was allowed to purchase our water at a fraction of what local residents and businesses pay.” Generations of families in the area had invested in the local water infrastructure for a century, but, without warning, a water board could decide what would happen to a public resource without consulting the community. Martin and her fellow-activists began organizing public meetings to make residents aware of what was happening, and they went to meetings of the Kingston Common Council and Kingston Water Board to interrogate members on their decision-making. “That’s what we were managing—from my bedroom,” Martin said, laughing. http://rebeccamartin.com/wp-content/uploads/2015/06/rm04.png 0 0 rebeccamartin http://rebeccamartin.com/wp-content/uploads/2015/06/rm04.png rebeccamartin2016-07-08 20:58:482016-07-08 20:58:48"A Jazz Singer Fights Niagara Bottling" in The New Yorker.